If you’re planning a private, charity or corporate golf tournament, let the golf specialists at Shuksan Golf Club do the work for you. The team at Shuksan Golf Club are experts at planning and managing Charity and Corporate Golf Tournaments for groups from 60 to 144 Golfers and more. We can arrange for on-course contests such as ‘Longest Drive’ and ‘Closest to the Pin’ as well as customizing merchandise with your organization's logo for hats, shirts or golf balls. 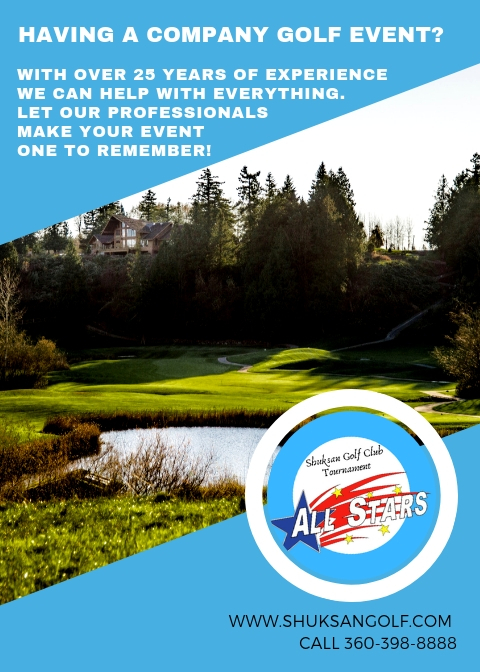 Throughout your event, Shuksan Golf Club Tournament Professionals will provide you and your Guests with friendly and helpful service that has kept organizations returning year after year.